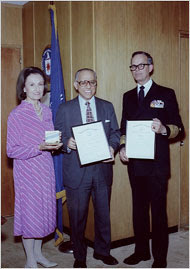 George Joannides, center, in July 1981, with his wife, Violet, and Bobby R. Inman, deputy director of the C.I.A. WASHINGTON, Oct. 17 (UPI) -- A U.S. judge says the CIA probably misled the Assassination Records Review Board's 1990s investigation into the 1963 assassination of President John F. Kennedy. Federal Judge John Tunheim, who served in 1994 and 1995 as the chairman of the congressionally created board, told The New York Times evidence unearthed by a lawsuit indicates the agency wasn't forthcoming about the role of its liaison to the board, the late CIA agent George Joannides. "I think we were probably misled by the agency," Tunheim said, referring to since-revealed records that dealt with Joannides' role within the agency. The documents showed that even as he served as the CIA liaison to the board, as it examined the activities of Kennedy assassin Lee Harvey Oswald prior to Kennedy's death, Joannides' role as the case officer overseeing Miami dissident Cuban groups in 1963 was never revealed, the Times said Saturday. Oswald physically clashed with the Cuban dissidents two months before the assassination and debated them on a radio program. "If we'd known of his role in Miami in 1963, we would have pressed for all his records," Tunheim told the newspaper.